EPIC is very excited to christen 2016 by moving to a brand new location on 9th Street in beautiful downtown Tacoma. In honor of the move this week, we’ll be celebrating this promising new location by looking at the rich history of 9th Street and downtown Tacoma. The area that now constitutes downtown Tacoma’s earliest settlers were Indigenous Americans (primarily the Puyallup peoples), who had settlements in the area for thousands of years. In the 1850s, settlers from elsewhere in the United States as well as European countries such as Sweden began to inhabit the area, building a variety of institutions, including sawmills, a post office, and—most notably—a stop along the Transcontinental Railroad (built in 1883.) When the then-split districts of New Tacoma and Old Tacoma merged on November 12th, 1875, The City of Tacoma became officially incorporated. After gold was discovered in the Klondike, the city’s prominence was sealed. 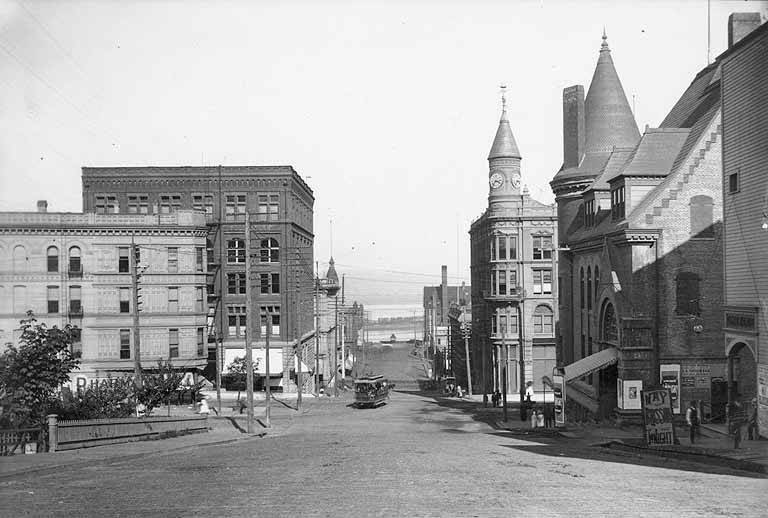 The turn of the 20th century began a long decline for downtown Tacoma and other parts of the city. This tragic downturn started with a mayoral decree (from Jacob Weisbach) that forcibly expelled hundreds of Chinese residents peacefully living in Tacoma—many of whom came from China against their will as slaves or indentured servants. Soon after, a massive streetcar accident in 1900 caused many casualties. Fortunately, in 1915 the city became a national destination for big time automobile racing due to a prestigious venue’s location just outside the city limits. This tenure was brief though, as the site was closed in 1922. From here, the city’s economic decline slowly worsened until hitting rock-bottom in the 1970s, when the city’s mayor at the time, Harold Moss, was known to make comparisons of downtown to war-torn Beirut. Thanks to significant efforts on the part of city residents and planners, the 1990s began a massive revitalization of downtown Tacoma. This urban renaissance was particularly encouraged by the establishment of Washington State History Museum, the University of Washington Tacoma Campus, the Museum of Glass, the Tacoma Art Museum, the federal courthouse in Union Station, and a light-rail line. We at Evergreen Personal Injury Counsel are thrilled to move to such a beautiful and historically rich district, especially given the pivotal role that downtown has played in this city’s meteoric resurgence as one of the nation’s greatest cities. As local Tacoma personal injury attorneys geared towards seeking justice for clients who have been jilted by corrupt employers, landlords, medical care providers or institutions, it should come as no surprise that we love a good comeback story.